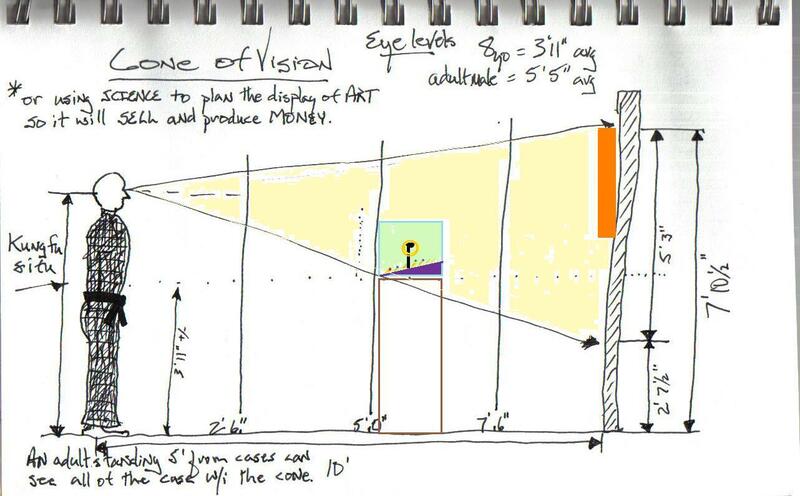 Here’s a basic graphic I drew of the concept of the Cone of Vision as presented by Mr. Larry Klein in Exhibits: Planning and Design. Below are some of my thoughts and ideas I’m incorporating into my new art festival booth design. Most festivals offer spaces 10×10 feet and depending on the venue there may be wide aisles or narrow lanes. I noticed that many folks walk a parallel line to the row of booths about 3 to 7 feet from the front of the tents or canopies. The person most likely to break away and shop will be the person walking closest to the booths. Let me indulge in describing a pet peeve – goofballs of all ages. They are usually carrying a turkey leg in the right hand, have purple goo from a grape snow cone running down their left hand and arm and they want to touch everything you have displayed and buy nothing. I have seen it too many times to sit passively and let them damage my goods. The answer to the question is glass and height. By placing a physical barrier in front of and above your jewelry you control who gets to touch. Glass is perfect. The benefit involves risk management and loss prevention – fancy terms for fewer thefts, less polishing and cleaning. Height limits the pre-teen kids, most do not have a credit card and they like to touch sparkly things. The average eye level of an 8-year-old is 3′-11″ and the perfect height for the base cabinet or structure for your display. Move the rear wall of your booth closer and hang display cases with belts, necklaces or framed blow-ups (orange rectangle) of your best-selling designs – sell more of them so you’ll make more units and cut your unit cost with production efficiencies. Sell more of what you know will sell. This means more profit. This entry was posted in marketing art and tagged art, booth, design, festival. Bookmark the permalink.